Professional guidance when buying your house in the sun and by the sea, in and around the towns of Málaga, Marbella, Torremolinos, Fuengirola, Mijas, Manilva, Nerja, Torre del Mar, Vélez-Málaga en Estepona. Beautiful apartments, penthouses and villas with magnificent views. In a dream location with all kinds of luxury amenities. Very innovative and sustainable residential complex in a green environment. Various extra options. New complex with apartments and penthouses, directly on and with views over the golf course. A 20-minute drive from the beach. Beautiful green and very quiet environment. Homes have recently been completed and ready for occupation. Unique bank repossession properties (ready to move in) in Casares Beach. First line beach, no sea views. Only 19 units for sale with 1 bed and 1 bathroom. Within walking distance of the beach, shops and more. New development on a fantastic location: only 600 meters from the beach. Unique complex with stunning panoramic sea views, 2 swimming pools, fitness and much more. Available with 2, 3 or 4 bedrooms. 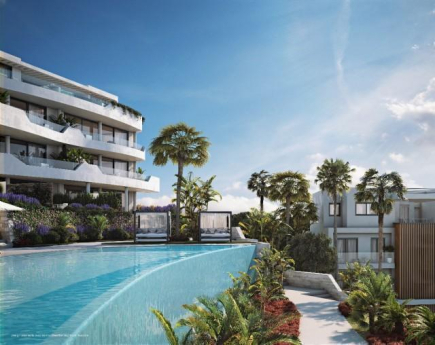 Spectacular new project located between Marbella en Benahavís, Within short walking distance from city centre and shops. With 2 or 3 bedrooms, infinity pool, sea views. Close to exclusive golf courses. Breathtaking apartment in Estepona. Luxury apartments, penthouses and villas, front line beach, on the exclusive New Golden Mile. Each home has a beautiful panoramic view. On the first line of a beautiful golf complex. Apartments and penthouses with 2 or 3 bedrooms with magnificent views. Within 10 minutes from Fuengirola and Málaga. Ideal location and high quality! Brand new complex which is located in a UNESCO protected area, within a 10 minute drive from the beaches of Marbella. With 2 or 3 bedrooms, including a solarium and terrace. Fantastic opportunity! With 2 or 3 bedrooms and terrace and just 5 minutes away from the famous resort of La Cala de Mijas. Complex has beautiful subtropical gardens and a swimming pool. Sea view - 2 bedrooms - terrace.